The Boating Industry Association of Victoria and Melbourne Zoo's AGL Marine Response Unit have launched Operation Bay Watch, aimed at lifting the surveillance for injured marine life on Port Phillip and Western Port Bay, where 68% of Victoria's 172,000 registered watercraft operate by engaging the boating community to keep a watch out for injured animals. Plastic rubbish and discarded fishing line is responsible for killing or maiming both sea birds and marine wild life, especially seals, which are often entangled in discarded fishing line and other plastic debris, such as netting or even packing tape. 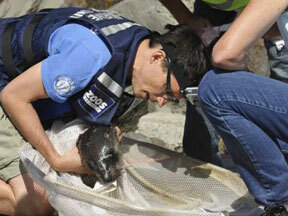 Add the Melbourne Zoo Marine Response Unit 1300 245 678 to your mobile phone. Take a photo on your mobile phone of the injured marine wildlife and text it to the ZOO’s AGL Marine Response Unit on 0447 158 676 with a description of the location. Follow up with phone call 1300 245 678.